We’ve watched as the Lash Group of Companies has explored new Toronto neighbourhoods and been among the first builders to introduce condos to Bathurst and St. Clair (The Rushton) and the Kipling and Westhumber Boulevard area (Cloud 9). Now, the company is introducing an ambitious new project to Markham and Ellesmere Roads in Scarborough. Me Living, a master planned community featuring a collection of stacked townhouses and 4 condo buildings, will be redevelopment landmark. “It’s a very quiet, unknown area, but it’s close enough to downtown Scarborough. You’re less than five minutes away from major shopping at the Scarborough Town Centre and you’re less than two minutes away from a major highway, the 401,” said Larry Blankenstein, President of the Lash Group. The project has also won a number of neighbourhood fans. Working with community residents and Councillor Glenn De Baeremaeker, the builder says the development seemed to be welcomed at City Hall. “At a meeting, Councillor Baeremaeker stood up and said for such a large project, we didn’t have one person opposing it at council. He’s never seen this before,” said Blankenstein. He credits the smooth sailing with the fact that the vision for the project was designed with local residents in mind. The actual design of the space will have a particular focus on amenities. Aside from transit, one of the new neighbourhood services will be a brand new park planned adjacent to the development. The green space will include a waterpark for kids, picnic areas and an outdoor fitness equipments for the adults. Me Living has its residents’ desires in mind. The project is full of unique features including a landscaped pond that will will transform into a skating rink in winter. Other standout amenities in the master-planned community include a pool, retail on the ground floor and guest suites for visitors. 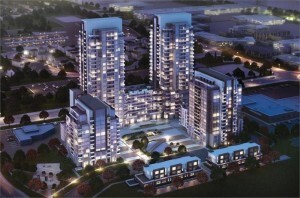 Suites will range from $149,000 to $360,000. The project is currently in its registration phase. For more information contact 647 693 7563 or info@meliving.ca.